Like the King Kong Vs Godzilla movie, the MX vs ATV gaming series cannot provide a satisfying answer about who or what would win in its titular contest, but the newest installment, Reflex, at least has a few very good ideas in it. Few dirt bikes or ATVs are driven in close proximity to Kotaku's New York branch office, but the cultural alienation from the sputtering, noisy and much-beloved sport racing vehicles is no barrier to appreciating their presence in a hit gaming series. But given the spectacle of Sony's MotorStorm series, THQ and Rainbow Studios' series needs to advance to still impress. Here's how the newest one is shaping up. 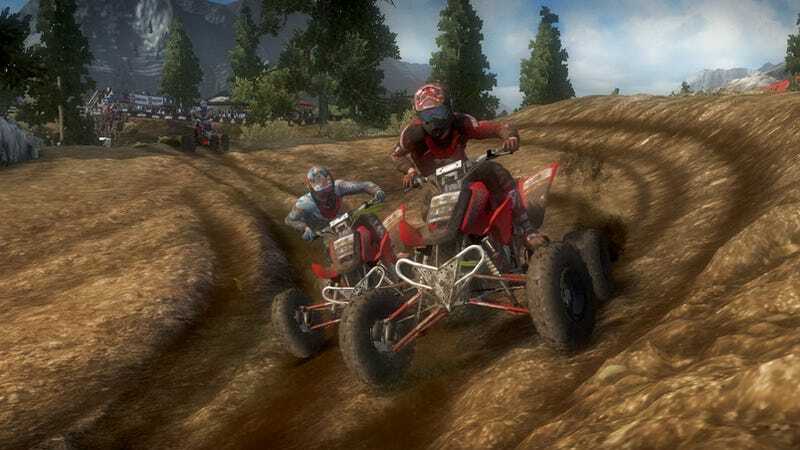 MX Vs. ATV Reflex is the latest in Rainbow Studios' decade-long series of games with similar or related names, including MX Vs. ATV Untamed, ATV Offroad Fury and more. This one's slated for an Xbox 360, PS3, DS, PSP release this holiday. I tested two of the game's main new features, a right-stick body-lean and some "physical" rut-creation. I did this in a few empty environments, a snowy mountainside set up for a race and a freestyle stunt course set up near an aircraft carrier. The game's set for a holiday release. Clumsy Hands: The new controls map body leaning to the right stick. They also map tricks to the right stick. The player switches the right stick from the former to the latter scheme by holding down a shoulder button. This is as simple a system as I can imagine but one that took some getting used to. When I took a jump in the freestyle bike park, I sometimes thought I was knocking the right stick every which-way to make tricks happen, but, because I pressed the wrong bumper, I was instead just leaning my rider every which-way. I think this is one of those instances where I take the blame, not the game. But it's something to watch out for when trying the game and testing the responsiveness of its controls. Signs of Life: The racing areas I showed were, for demo purposes, sparsely populated. But in an age of high-calamity racetracks like those seen in Disney's upcoming Split/Second or the party-on-the-roadside rave racing of MX vs ATV competitor MotorStorm, fans may be looking for a lot of excitement and energy on the periphery of their racing, not just on the track. It remains to be seen if MX Vs. ATV will have an abundance of that. The Lean: When riding a bike or an ATV, the left analog stick turns the wheels. The right analog stick shifts the rider's weight. So regular turns just involve leaning the left stick. Sharp turns are made by leaning both sticks. Leaning the rider's body in the air helps tilt an airborne vehicle. The mapping is perfectly intuitive and feels great. The Analog Tricks: Tricks in the game are now inputted with about 70 variations of right analog-stick movement. Gone are button presses, replaced by a more intuitive and fluid system, one that feels reminiscent of inputting fighting game quarter-circle attacks. The Creative Ruts: Many games allow players to drive ruts into the ground. The THQ rep showing me MX Vs ATV: Reflex said that no racing game until this one made those ruts have physical properties in their games. I'm not sure that's correct, but it makes me no less impressed with how well it worked in Reflex. Mud, snow and other non-hard surfaces can be dug into by tires, feet dangling from sharp-turning bikes or even from the impact of a body after a crash. The ruts and divots re-shape the track and, despite all the donuts I made in the mud, they stay in memory for multiple laps. This is how it should work. No, I still don't want an ATV for Christmas this year. But the creative decisions made in MX Vs ATV are smart enough to make this a racing game to care about even for people who aren't fans of the title vehicles in real life. The racing works. The innovations feel right. This one is on its right track, so far.